Too hard to say ‘yes’? HE spoke in soft broken English, a face full of pain, and the 750 strong audience at Friends Meeting House in Euston on Tuesday was enthralled. I suppose it couldn’t have been otherwise. Here was a former captain in the Israeli Air Force, flying Black Hawk helicopters, who had declared himself a Refusenik, and would no longer serve in the Israeli armed forces. He had been in the air force for eight years, tried to comfort families whose relatives had been killed in suicide attacks, and yet, had decided to talk to the Arabs to find out why they were prepared to kill Israelis. “I talked for 18 months to Arabs,” Yanoton Shapira told the meeting called by Enough, a new coalition set up to seek a “just settlement” between Israelis and Palestinians. “We were very suspicious of each other, but then we got to know each other, and now we are brothers,” he said. I’m pretty agnostic when it comes to a solution to the murderous events in Israel and Palestine. But equally I am fascinated to discover there are many Jews who want a new approach to the bloody crisis. 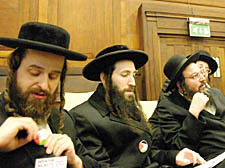 Apart from the Israeli Refusenik who spoke – and he said there were 8,000 Refuseniks in Israel – I also spotted a group of Orthodox Jewish rabbis (pictured). One of them handed out leaflets – headed The Palestine Issue – as people entered the hall saying that according to “Jewish law” Jews cannot reclaim (Palestine) by military means – only the “Creator” can choose to “redeem all mankind”. The meeting followed the launch earlier on Tuesday at Westminster of the organisation Enough backed by a stream of actors including Emma Thompson, Miriam Margolyes, Zoe Wanamaker, Stephen Fry and Richard Wilson as well as film directors Mike Leigh and Ken Loach. ARE the doctors in Britain on the march against the flurry of reforms causing chaos in the National Health Service? I wrote the other week about a conference of doctors and hospital staff in Euston held to organise regional protests against New Labour’s plans. Was I exaggerating such early signs of rebellion? Perhaps, but this week on an internet message board for doctors appears a call for a demonstration, asking them to join a protest on March 17 against the “failed Department of Health policy”. “The march will be a white coat march as a funeral cortege with pall-bearers carrying oversized coffins...”, says the message. The march will start at the head office of the Royal College of Physicians in Regent’s Park and end at the Royal College of Surgeons in Lincoln’s Inn Fields. The message board also carries a plea urging doctors to sign a protest petition in support of junior doctors face who face unemployment due to new recruitment practices introduced by the Department of Health (DoH). “It is not too late for the public to be informed of the atrocious treatment of hard-working doctors by the government,” says the internet message. So far, more than 2,500 doctors have signed the petition according to the message board. While it is not possible to confirm the authenticity of this internet petition, there is little doubt about a critical letter that appeared in The Times on Tuesday signed by doctors of a GP practice in Milton Keynes and supported by 200 signatures. It was forwarded to me by Dr Rhiannon Lloyd, a GP of Belsize Park whose practice is in Brent. It argues that GPs are not responsible for the financial crisis of the NHS and says the government is trying to “soften up public opinion” for the creation of private health companies. IS the film Notes on a Scandal – about an affair between a teacher and a young boy – based on real events at a Camden school? The author of the novel Zoe Heller went to Haverstock School in the late 1970s, along with David Miliband, now a cabinet minister, and former football star John Barnes. But publicists for the film – starring Dame Judi Dench and Cate Blanchett – are keeping mum. At a talk at Hampstead Theatre the director Richard Eyre said it was hoped to cast a local pupil for the film but all auditions failed. Eventually, a boy was found in Northern Ireland for the part. In the book on which the film is based, the teacher who has the affair is described as going for walks on Hampstead Heath – this would suggest Heller had William Ellis or Parliament Hill schools in mind as both are a few yards from the Heath. Certainly Haverstock school isn’t. Or did it all come out of Heller’s rich imagination? REGULARS at the Tavern Inn the Town in Camden Town were heard to say ‘It’s a fix!” when it was announced on TV that Shilpa had won Celebrity Big Brother with 63 per cent of the votes. I’m glad Shilpa won, but it seems I’m not the only one who wonders why Channel 4 does not reveal actual figures on how many voted by phone or text. It’s easy to give a percentage figure because such figures do not mean anything unless they are backed up with hard figures. I discovered from Channel 4 that it is not their ‘policy’ to disclose actual voting figures but that they are given later when the TV channel donates money to charity. We shall see. SIR Antony Sher is truly an artist for all seasons. His public mark has been made as an actor and novelist, and next week he exhibits another side of his personality – that of a very talented artist. Sher, who will be appearing soon in the West End in Jean Paul Sartre’s play, Keane, is staging from Monday a solo exhibition of paintings, many as self-portraits of his stage parts at the Jewish Cultural Centre in North End Road, Golders Green. As a teenager it was assumed in South Africa he would go to art school but somehow his focus switched to acting. His exhibition is dedicated to his old art teacher John McCabe and his mother who died last November. Pictured: Sher with Harriet Walter in a painting called The Macbeths and inset, aSher as Primo Levi.